Who should we allow to come into the United States? What do we do with all the illegal people who are already in the U.S.? Those are some of the big questions that need to be sorted out if a solution is to ever be found to this crisis. It is a “crisis” indeed – because the problem we currently face has a very complex solution – because it involves real people, both adults and children, with individual stories of how they came to the United States. There are an estimated 12-13 million illegal immigrants currently in the U.S. So as Christ followers, how do we respond to this complex issue? The Bible instructs us to love our neighbor while also modeling for us that is appropriate to construct walls and otherwise limit entry into our country. So it would seem there is a conflict between the law of the land and law of love. But is that really the case? Is it consistent with Scripture both to love the alien among us and limit the entry of those from other countries? create a balanced, reasonable approach to Legal Residents and potentially provide citizenship for illegal immigrants who are in the US with specific skills, no criminal record, married with families that are citizens of the U.S., etc. 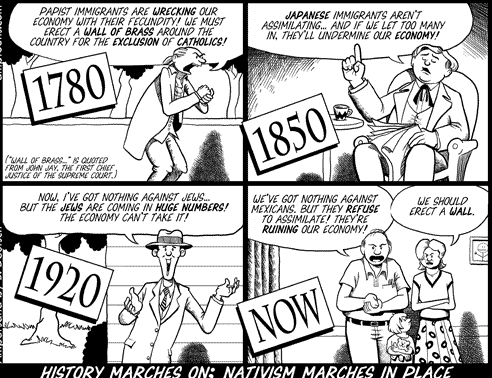 Finally, as you consider your position, it would be easy to feel this is a “new problem for our country.” But check out these historical quotes and this cartoon.